Captain Bill Doherty provides oral and written testimony regarding cruise safety. While other entities seem worried about the economics or aftereffects of such moves, Nexus is focused on making cruising safer for passengers, period. Nexus Consulting Group of Alexandria, LLC, a leading provider of private maritime safety and security solutions, is pleased to announce successful participation in a United States Senate committee hearing on cruise safety. 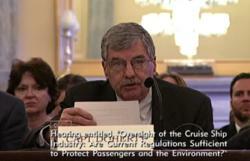 Nexus’ Captain Bill Doherty was invited to testify, and focused his oral comments on passenger safety measures. In his statements, Captain Doherty highlighted Nexus’ proposed independent passenger distress calls, as well as inspection process improvements to ensure passenger safety and security. Doherty’s comments were unique among a panel of varying groups, including representatives from the cruise industry, the port of Miami and the U.S Coast Guard. Much of testimony focused on the business aspects of cruise safety and the logistics of inspections, while Nexus’ Captain Doherty focused on the passengers themselves. Captain Doherty’s written testimony, which is now in the public record, focused on passenger empowerment both in terms of physical safety on board, as well as financially during and following potential disasters. In his written statement, Doherty also proposed other significant industry changes, such as a crew member “zero tolerance” policy towards alcohol and drug use aboard ship. The Senate committee is chaired by Senator Jay Rockefeller (D-WV). Senators Marco Rubio (R-FL) and Mark Begich (D-AK) were among other committee members whose states are directly affected by the cruise industry, and thus have a vested interest in being certain passenger safety and environmental concerns are addressed. The Senate [Committee for Commerce, Science and Transportation] hearing took place on March 1st, 2012. The hearing archive is available online. Nexus Consulting Group is taking the lead in demanding change from a key travel industry, with cruise safety specialists and programs designed to assist cruise lines with their safety management. To discuss Nexus’ cruise safety services, please contact Nexus Consulting at 703-224-8984. To view Captain Doherty’s full recommendation to the cruise industry as a former Safety Manager for a major cruise line, please see the “What can we learn from the Costa Concordia?” white paper on the Nexus site. For specifics on the changes Nexus is proposing for the cruise industry, please see the recent op-ed in Maritime Executive magazine. Captain Bill Doherty is a 1967 graduate of the Massachusetts Maritime Academy, a licensed US Coast Guard Master-Unlimited tonnage, and qualified First Class Pilot, Prince William Sound, Valdez, Alaska. Captain Doherty has served on numerous U.S. Navy warships and was the Head of Maritime Affairs for the Chief of Naval Operations during Operation Desert Storm. Over the course of his career, he has commanded tankers, container ships, research vessels, high-speed ferries, and was an instructor at his alma mater. Before retirement, his latest position was as Safety Manager for Norwegian Cruise Lines. Captain Doherty now serves as the director of maritime affairs for Nexus Consulting, and has appeared as a cruise safety expert before the United States Senate. Established in 2005, Nexus Consulting is a US veteran-owned and operated private safety and security company that places unprecedented focus on compliance while actively protecting passengers, crews, equipment and cargo from maritime threats. Internationally, Nexus Consulting is taking the lead in maritime security utilizing the Nexus Solution. Nexus also offers marine safety and security consulting services to private shipping fleets, cargo vessels and cruise lines.